El Pasajero Editor Jose Ubaldo took the above photo this morning on Alameda Street near Union Station. It’s no secret gas prices have been on the rise lately and as of Monday averaged $4.04 for a gallon of regular in California. As for the price above — that’s Death Valley prices, people! Load a Day Pass on your TAP card for just $5. As a convenience for those who don’t already have a card, regular TAP cards will be available for purchase with a Day Pass for a total of $6. Like all TAP cards, they can reloaded again and again with any TAP product, including the $5 Day Pass. You can load a $5 Day Pass onto your TAP card at Metro Customer Centers, retail TAP vendors and ticket vending machines. If you don’t already have a card, you can purchase one with your pass at these locations for an additional $2. In addition, a weekly Metro pass is $20 and a monthly pass $75. A monthly EZ Pass that allows for travel on Metro many other buses in Los Angeles County is $84. More info on fares here. Not to take anything away from the idea of getting more people on Commuter Transit, but this particular station is a horrible example. It is always significantly higher in price than even other Chevron Stations in the area (which are always 10-15 cents/gallon higher than the closest ARCO.) I’m not sure how they get away with it other than preying on customers that are on “E” and have no where else to go. Isn’t that station famous for having the most expensive gas in a 20 mile radius? 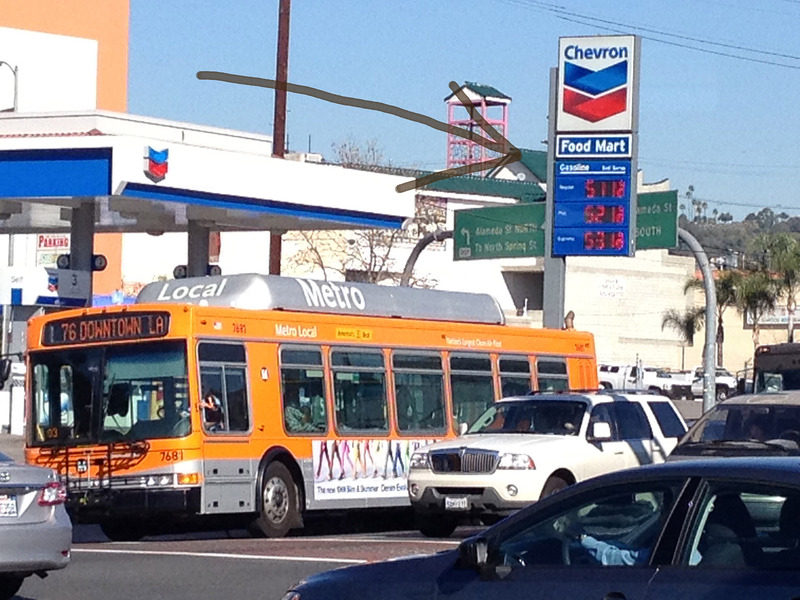 It clearly says in the photo’s caption: “It’s no secret gas prices have been on the rise lately and as of Monday averaged $4.04 for a gallon of regular in California.” Even at 4 bucks per gallon, a $5 Metro Day Pass is well worth it. How far does a gallon take you? 10, 15, 20 miles? PLUS, who wants to be sitting on the 101 and 110 through downtown at rush hour? It takes me just as long to DRIVE home as it does to GO METRO home!!! Don’t forget, the ability to take MULTIPLE modes of Metro Transit. On my Metro commute, if I pay for each Gold Line, Red Line, and 14 Bus individually at $1.50 each, one way, I’d pay $4.50, ONE WAY. On my commute home, I’m already saving cash! Again, the choice FOR ME could not be MORE clear! GO METRO! Maybe perhaps trading in your vehicle for a more fuel efficient one would be a better way to go. Most gas cars sold today get twice as much gas mileage. Hybrids are closing in at 60 MPGs now. Probably also a rental car effect from the people who rent cars from Union Station. Just go to the other side of the 5 and you can save a buck a gallon. Thanks for your concern and knowledgeable advice, but why would I want to buy a car now? I drive my wife’s car, when I HAVE to, sorry I was not more specific. Also, sorry for my low estimate. “Stop and Go” traffic isn’t that great for Fuel Economy, I’ve heard. Say I get EXACTLY 30 MPG. At $4 per gallon, that’s still ABOUT $23.33 per week. How much does a weekly Metro pass cost? $20. FOR ME…I’d rather not spend 3 dollars and 30 cents per week to be stressed out sitting in LA traffic. Isn’t that the point this article is trying to make? Yes, but gas is available all over town. Just where again can I buy a transit pass?